Discussion forums are commonly used to generate interaction among students, and research shows that higher-level thinking is possible. But all too often discussion prompts can be stale and unimaginative. Several Ecampus math classes are using discussion prompts in a creative way to help students develop meta-cognitive skills related to their learning. The first is a reflection activity. After the assignment is graded, the instructor releases an answer key so students can look back at their work. “Learning from our mistakes, we start to understand what we are doing properly and what we are doing improperly,” explains the instructor in the purpose statement for the reflection forum. For questions answered incorrectly, or where they struggled with a particular problem, students are to post why the solution makes sense. If, after seeing the correct answers, students are still confused about a problem or the solution’s explanation, they should ask questions about what is unclear. And for those students got the answers right, they discuss which problem was most challenging and describe the specific tasks, tools, or resources they used to get it right. 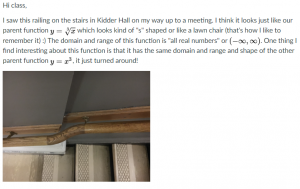 The second creative discussion assignment from this class is a photo hunt, where students identify examples of math found in the everyday world, as well as connecting them with their peers. 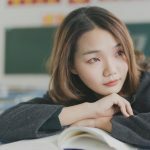 Students share photos and address the questions in their original post, which helps them connect with peers. As an example of how to satisfy this assignment, the instructor posted this message and image. I snuck a peek at some of the student posts and they were inspiring! The students were completely engaged, finding pictures of common, everyday things, including bookcases, steer horns, a slingshot, fallen trees, bicycle seats, a dolphin at Sea World, kitchen faucets, a cattle brand, artwork, Grand Central Station in NYC, flower petals, a tea kettle handle, roof tops, a baseball field, a candle snuffer, Hawaiian tide pools…even pets! And those are just from one of the four photo hunt assignments! Since these students are from a variety of geographic locations in rural and urban areas, the photos represent a diverse and compelling range of creative and stimulating examples. Math is everywhere! As you can see from these two examples, discussion forums in an online course can be creative, fun, unique and engaging. Think about if there are ways to include images or graphic representations relevant for your discipline. With cell phones and video readily at hand for many students, it’s an easy way to get them involved and actively engaged. Christopher, M. M., Thomas, J. A., & Tallent-Runnels, M. K. (2004). Raising the Bar: Encouraging High Level Thinking in Online Discussion Forums. Roeper Review, 26(3), 166-171. With excitement and a bit of apprehension I logged in to my first ever online class. Sure, I’ve taught online classes for years, but this was my first time as a student in an online class that I had paid to take and where grades were given. I reviewed the “Start Here” module and familiarized myself with the structure of the class before I opened the first lecture from my new instructor. The instructor’s voice came through my speakers and as she began to speak I noted the length of the lecture: 44 minutes. “What?!? I don’t have time for this,” I thought as I slammed my laptop shut. It suddenly and powerfully occurred to me that I did not have control over this classroom and my expectations as a student might be vastly different from my instructor’s. Eventually, I settled in to the rhythm of the class and my instructor’s expectations. As it turns out, that 44 minute lecture was an outlier (the rest were closer to 15 minutes), and I figured out a way to incorporate the lectures into my schedule (I watched them while on the spin bike). Provide time estimates for weekly activities. Estimated read times and watch times for learning materials are very helpful for a busy student trying to plan the week. Chunk the material. As an online student, I rarely had long chunks of time to work on my classes, but I could squeeze in smaller chunks of time here and there. And while students can start and stop a task as needed in the online classroom, it’s rewarding to actually finish a task in one sitting. Make it easy to find class resources. In the online classroom there are many wonderful learning materials we can easily incorporate (e.g., links to blogs, videos, calculators); but when these resources are scattered throughout 10 learning modules, they can be difficult for the student to find. Provide a works cited page (with hyperlinks) or a glossary of key terms to help students locate material, especially when studying for exams. Anticipate Questions. This might be tough the first time you teach a course, but over time we often see the same questions arising from our students. We can reduce the delay in response time, by anticipating these questions and providing answers and support ahead of time. This could be a Q&A sheet for complex assignments or a guided worksheet with comments from the instructor to help students get through well-known tricky spots. The flexibility of the online classroom gives busy students around the world access to educational opportunities that have not been available in the past. These students are working hard in every aspect of their lives and with a little support from us, their online instructors, we can help them make the most of the time they have in order to learn and grow. Posted in Resources, Tools & Trends, Tips & Tricks, Uncategorized. I recently attended one of Bryan Alexander’s Future Trend’s Forum webinar session (recording on youtube) on apps educators use in their work and in their life and learned about some very interesting apps. 🌲Forest: an app to monitor time off phone (for personal use or group use, family use, etc.). 📈 Desmos: Graph functions, plot data, evaluate equations, explore transformations, and much more – for free! ➗Algebrabyhand: The most advanced drag and drop algebra tool for the web. 🏃‍♂️Fabulous is a science-based app, incubated in Duke’s Behavioral Economics Lab, that will help you build healthy rituals into your life, just like an elite athlete. 🧘Calm: App for meditation and sleep. 📚Meet Libby: a ground-breaking ebook reader and a beautiful audiobook player to read any book from your local library. 👨‍💻Vuforia Chalk: Vuforia Chalk makes it easy when troubleshooting or expert guidance is needed for situations not covered in training or service manuals. 📰Newsmeister: stay current with news challenge quizzes. 👩🏻‍🏫Studytree: StudyTree analyzes students’ grades and behavioral patterns to construct customized recommendations to improve their academic performance. Additionally, StudyTree serves advisors and administrators by providing them managerial access to the application, which enables insight to useful statistics and an overview of each student’s individual progress. Flipgrid: video for student engagement (recently purchased by Microsoft, not sure if any feature will change soon). Marcopolo: face-to-face messaging app for one-to-one and group conversations—bringing family and friends closer than ever with genuine conversations and moments shared. It could be used for student mock interviews and direct messaging within a group. goosechase: scavenger hunts for the masses. 🎫Tripit: find all your travel plans in one place. 🛍rememberthemilk: the smart to-do app for busy people. ⌛wunderlist: the easiest way to get stuff done. 🎧Stitcher: Podcast aggregator allows you to get the latest episodes of your favorite podcasts wherever and whenever you want. 🌐inoreader: The content reader for power users who want to save time. 🎧Overcast: A powerful yet simple podcast player for iPhone, iPad, and Apple Watch, which dynamically shortens silences in talk shows. Where to keep up with all the new tools and apps? If you have handy apps that make your life easier, feel free to share with us. We’d love to hear from you. Posted in Multimedia, Resources, Tools & Trends, Uncategorized. Along with the vast growth of fully online education, a corresponding trend is the growing popularity of hybrid (or blended) courses and programs. OSU defines a hybrid course as one that includes both regularly scheduled on-site classroom meetings and significant online out-of-classroom components that replace regularly scheduled class meeting time. 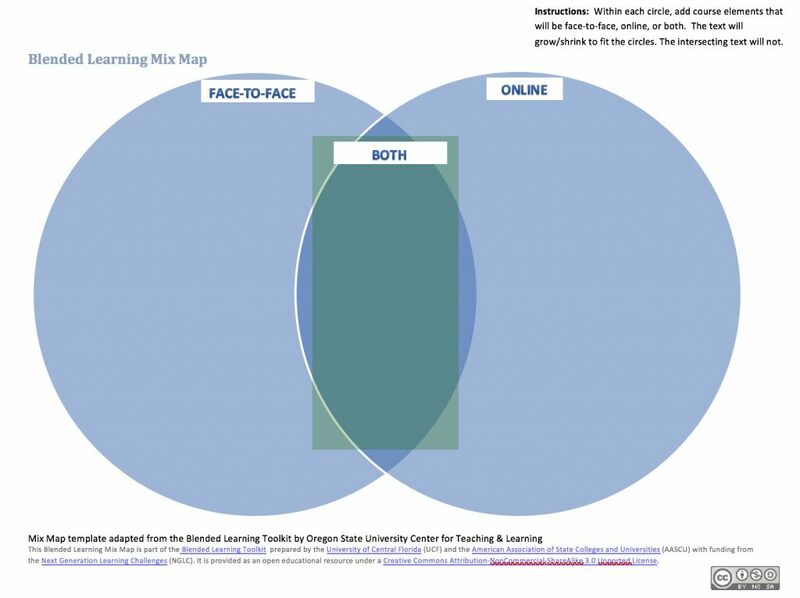 The blended learning mix map from the Blended Learning Toolkit is a widely used tool to visualize a hybrid course under design or redesign. This simple template of two overlapping circles provides space to list online learning activities, face-to-face learning activities and possibly activities that occur in both learning environments. For example, discussions may be a regular course activity online, in class, or in both environments. Much of the real value of developing a mix map is gained from drawing arrows to connect each element of the course to one or more other elements. For example, an arrow may show that course videos are linked to weekly quizzes that assess student mastery of the video content. Arrows can also be used to add information about the the pedagogical purpose behind the connection of elements as in a sample mix map from Univ. of Central Florida’s Kathie Holland. Anthony Klotz, OSU assistant professor of business, illustrates 10 weeks of teaching-and-learning progression with his sample MGMT 453 mix map. He shows that discussion, review and Q&A take place throughout MGMT 453 both online and face-to-face. OSU’s Hybrid Learning website provides downloadable mix map templates and more sample mix maps. If sketching out a mix map for a whole course seems daunting, then beginning with a mix map of a typical week of the course may be the place to start. A weekly mix map, as a representative chunk of the course may provide a conceptual template for many of the other weeks of the same course. It gives a snapshot of the balance between online and face-to-face components. For example, does the proposed mix map for your course seem to show a classroom course with some online supplements? Or does it show an online course with an occasional face-to-face check-in? The mix map is valuable to diagnose whether a hybrid course under design is actually a course and a half. Has a 4-credit course taken on the appearance and corresponding student workload of a 6-credit course? If you add a time estimate to each course element on the mix map (for instance, 2 hours to complete the weekly reading), what do all the activities in a week add up to? The connecting arrows are useful to assess whether the course elements are well integrated. Are the online and face-to-face learning activities deeply interwoven or will students perceive the hybrid course as two separate courses, one online and one in-class, running on parallel tracks? The mix map can be used as well to check alignment of learning activities with course learning outcomes or with more granular weekly learning objectives. Ask yourself, how do specific activities and the forms of assessment connected to them on the mix map align with your learning outcomes? Consider using a mix map! Faculty developing blended courses frequently find that spending even 10-15 minutes sketching out their planned hybrid courses on these “magic circles” can lead to significant insights about course design. Posted in Resources, Tools & Trends. 2018 Ecampus Faculty Forum concluded a month ago. However, I am still fascinated by the dedicated quality work our selected online instructors have showcased that day. You can access recorded sessions and view SlideDecks here. Lectures: notes and transcripts help greatly and she poses a question for online instructors to ponder: what is the point of your lecture? Textbook vs no textbook: if there is no textbook used, please make sure all the resources are easy to find and are listed in one easy-to-find location as well. 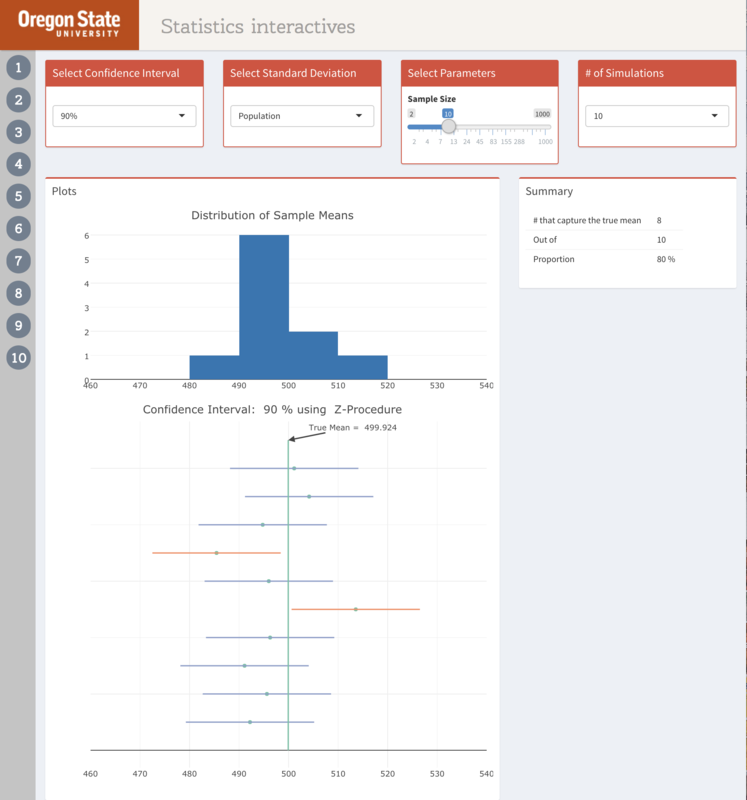 Engage her online students by showing results of opinion polls to the whole class and showing how class performance curves so students know where they stand in the class as compared to their fellow classmates anonymously. Estimated weekly reading time and estimated completion time for each assignment help students budget/plan study time efficiently. With the help of Ecampus media developers, Statistics instructor Katie Jager helps all her students succeed in learning by creating visualization models and simulations of statistical applets. Computer Science instructor Terry Roaker uses reflective journals to help students practicing high level critical thinking and evaluating skills. The lunch time keynote speaker, Professor Kevin Gannon, gently persuades us to design for accessible, equitable and dialogic learning, with a lens of inclusive pedagogical perspective. Together with an interactive ball-passing course design challenge and solutions exchange activity, Ecampus instructional designers’ pedagogy session introduced audience to 12 common pedagogical approaches and listed over 20 approaches and their examples (link to pedagogy and for teaching strategy examples and resources on pedagogy and learning design strategies. Jen Beamer from School of Biological and Population Health Sciences and Christine Kelly from College of Engineering shared their success recipe for facilitating engaging role play and debate in online discussion forum. 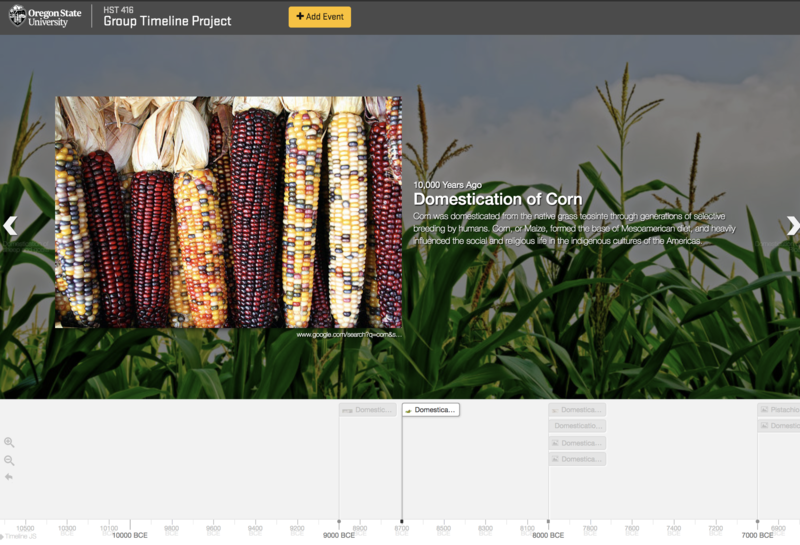 History instructor Nick Foreman and Ecampus media developer Mark Kindred presented their learner-generated content activity: timeline of Food Origins. If you are exploring online teaching strategies in any of the above areas, feel free to reach out to the instructors who have presented at Faculty Forum. I am sure they would love to share more in detail with you on the specifics of how they made it work for their online courses. Recently, I attended an open textbook network workshop, hosted by Oregon State University and sponsored by Open Oregon Educational Resources and OSU’s Affordable Learning Initiative. If you are an instructor or a faculty administrator who cares about the impact of textbook costs on our students and want to learn what you can do about it, I would highly recommend to continue reading. Open textbooks are textbooks that are free and can be used either in whole or in part at no cost. They are often written by experts, scholars, and professors in their respective fields and are edited and published in the same matter as commercial textbooks. 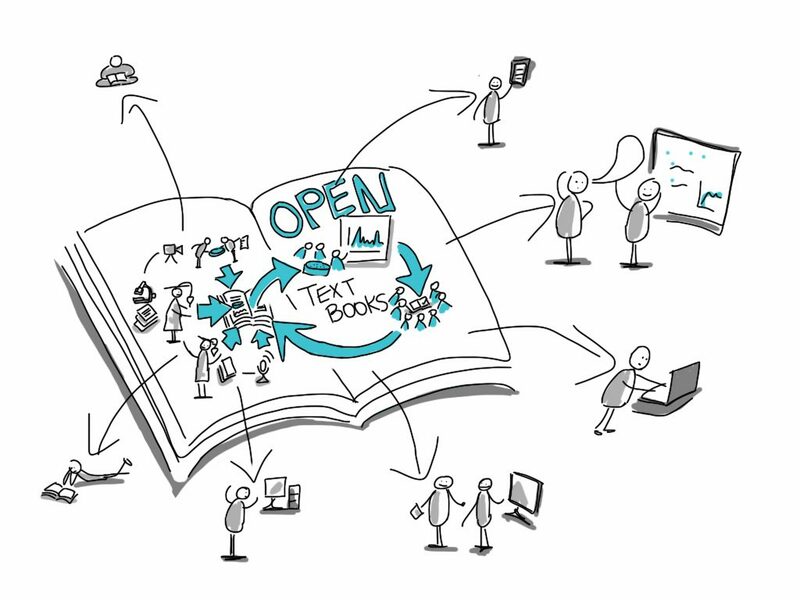 Open textbooks are licensed with an open license giving users permission to access, reuse, share, and adapt materials with few or no restrictions and at no cost. For students it makes college more accessible, as all students have access to the course materials on the first day of the course, as well as being more affordable by eliminating the costs incurred from purchasing textbooks. For instructors it provides more course materials options, as well as gives instructors the permission to freely customize and adapt the content to meet their students’ needs. The workshop also provides a list of networks and opportunities to get involved in reviewing, researching, adopting, or authoring open textbooks and educational resources. Open Textbook Network – In addition to providing a list of peer reviewed open textbooks on the Open Textbook Library site, this network invites participants of this workshop to write and submit a review of an open textbook for a $200 stipend. OpenEdGroup.org – This network provides access to research studies and an OER Adoption Research Toolkit. They also invite anyone interested in designing with open educational resources to apply and join the Designing with OER (DOER) Fellows Program. OSU Ecampus Research Unit – This OSU unit provides access to research projects as well as provides internal funding opportunities for OSU faculty to research how online education (including open education) impacts teaching and learning. OpenOregon.org – This network provides access to open educational resources as well as provides opportunities to apply for grant funding to develop OERs. OSU Open Oregon State – This OSU unit provides access to open educational resources as well as provides internal funding opportunities for OSU faculty to adopt, adapt, or write an open textbook as well as design and develop other OERs. The first post about active learning looked at how to include active learning in an online course. You heard about how a history professor used an interactive timeline. Each student added images, facts, and descriptions to the timeline, and the result was a visually-rich historical review. Students had fun while learning about facts and events. This is an example of collaboration and active learning at its best. The second example focused on interactive textbooks as an alternative to printed books. The Top Hat product combined words, images, video, and engaging activities to improve learning and make it more active. In today’s post we look at two new active learning ideas: mind mapping and annotated reading. Although these two technologies are different from each other, they offer similar benefits. Mind mapping requires the student to visually depict a concept, process, or system. Students label relevant parts or steps, show how these are connected, and identify key relationships. Annotated reading, on the other hand, allows students to enter short comments to passages of text, which encourages peer-to-peer interaction and sharing. While reading, students identify confusing sections, ask (or answer) questions, and interact with others. Both methods actively engage students in the learning process and support them to apply and analyze course concepts. 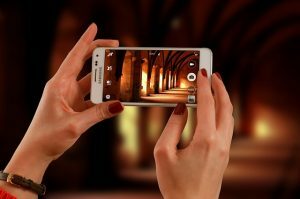 You know the famous quip about pictures, so let’s consider how using a visually-based tool for active-learning can support online learners. Wikipedia defines mind mapping as “a diagram used to visually organize information.” Similar tools are concept maps and information maps. Why are images important for learning? Mind maps help students understand concepts, ideas, and relationships. According to Wikipedia, a meta-study found that “concept mapping is more effective than ‘reading text passages, attending lectures, and participating in class discussions. '” One reason is because mind maps mimic how our brain works. They help us see the “big picture” and make important connections. Not only are mind maps visually appealing, they are also fun to create! Students can work alone or in teams. 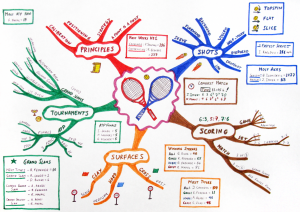 This mind map about tennis is colorful and stimulating. If you want to try mind mapping yourself, here’s a free tool called MindMup. There are many others available, some free and others with modest fees. The Ecampus team created an active learning resources mind map, made with MindMeister. Take a look. There are a lot of great ideas listed. Try a few! Most classes assign reading to students. Yet reading is a solo activity, so it offers a lower level of active learning. But there are ways to raise reading’s active learning value, with or without technology. Using a technique called close reading, students get more active learning benefits. Close reading is a unique way to read, usually done with short sections of text. With careful focus, close reading helps students reach a deeper understanding of the author’s ideas, meaning and message. If you want to add technology, you can make reading even more active! Using an app called Perusall, reading becomes a collaborative activity. Perusall lets students add comments to the reading and see what others are saying. Students can post questions or respond. Instructors set guidelines for the number of entries and discover which content is most confusing. Originally built for the face-to-face classroom, Perusall is also an effective tool for online learning. Perusall is like social networking in the textbook. It helps students engage with materials and be more prepared to apply the concepts and principles to later assignments. Perusall can be used with or without the close reading technique. Let us know if you have questions or want to try an idea. We are here to help! If you are already working with an Ecampus instructional designer, contact them to ask about these active learning technologies. Or send an email to me, susan.fein@oregonstate.edu, and I’ll be happy to point you in the right direction. Chickering, Arthur W., and Zelda F. Gamson. (1987). “Seven Principles for Good Practice.” AAHE Bulletin 39: 3-7. ED 282 491. 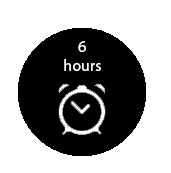 6 pp. MF-01; PC-01. Lang, J. (2016). Small Teaching. San Francisco: Jossey-Bass. Nist, S., & Holschuh, J. (2000). Active learning: strategies for college success. Boston: Allyn and Bacon. 202-218. Serafini, F. (2013). “Close Readings and Children’s Literature.” Reading Teacher, 67(4), 299-301. Simpson, M., & Nist, S. (1990). “Textbook annotation: An effective and efficient study strategy for college students.” Journal of Reading, 34: 122-129. On May 2nd, Ecampus held our annual Faculty Forum which showcases the outstanding work that OSU is doing in online education. Sixteen interactive sessions allowed faculty the opportunity to learn more about innovative teaching methods and share their experiences in online teaching with each other. This year we were delighted to have Dr. Kevin Gannon, a professor of history and director for the Center for Excellence in Teaching and Education at Grand View University, present a keynote address on a very timely and relevant topic for all online educators – designing online classrooms where inclusive discussions can take place while effectively engaging students with challenging or controversial materials. His presentation – Sea lions, trolls, and flames – oh my! 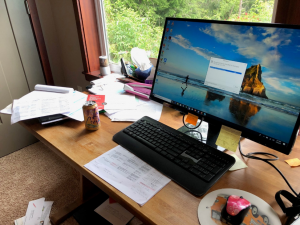 Navigating the difficulty places in online learning – was a thought-provoking and inspiring call to action for online educators. Posted in Faculty Forum, Resources, Tools & Trends. May I have your attention please? This is what we are saying when we add an announcement to an online course. Typically, the announcement tool is used for reminders, deadlines, or other key pieces of information. Announcements are quick, efficient statements meant to get the point across in just a few words. 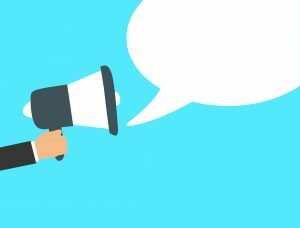 But have you considered using the announcement tool to promote instructor presence? As Arbaugh (2010) noted, “Instructor presence is a positive predictor of perceived learning and student satisfaction.” Students want instructors that are engaged or present in the course (Eom, Wen & Ashill, 2006). This is easy to achieve in a face-to-face classroom, where students can see the instructor, ask questions, and get immediate feedback. Achieving this can be difficult for online instructors, though. 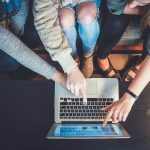 Given the 24/7 nature of the online classroom, engaging with students in a timely, effective, and efficient manner can seem time consuming and sometimes daunting to instructors. The announcement tool is an effective and efficient way for instructors to remind students they are on hand and involved. Try using the announcement tool to summarize the week’s activities or discussions and provide insight into content. Or maybe use it to point out key topics and notable student discourse. These are just a couple of great strategies for maintaining presence in your course without feeling you have to participate in every discussion post. Arbaugh, J. (2010). Sage, guide, both, or even more? An examination of instructor activity in online MBA courses. Computers & Education., 55(3), 1234–1244. Eom, S. B., Wen, H. J., & Ashill, N. (2006). The Determinants of Students’ Perceived Learning Outcomes and Satisfaction in University Online Education: An Empirical Investigation*. Decision Sciences Journal of Innovative Education, 4(2), 215–235. Having a guest expert video in your Ecampus course provides a number of learning benefits. One important benefit is to introduce a second, collaborative voice to instruction (Last, 2015). In Part I of this two-part article series we address interview planning decisions and their relationship to producing an engaging guest expert video. In Part II we explore the value of instructors collaborating in the post production stage of guest expert interview video editing. Staging the video capture of an outside expert voice was the focus of the first article on this topic in a previous blog post. Once primary and B-roll video is captured it needs to be compiled and arranged into a coherent presentation for your course. This is where working with an Ecampus video editor comes into play. Students see an enormous amount of video in their academic experience. Developing video content that is focused, tightly packaged, and presented in an interesting fashion makes your guest expert video worth watching. The ultimate purpose of editing your guest expert video is to ensure it contributes to the learning objectives of your course. This is why faculty, as subject matter experts, become valued collaborators in the editing process. Uses an mixture of artistic and technical skills to assemble shots into a coherent whole. Has a strong sense of pace, rhythm, and storytelling. Works creatively to layer together images, story, dialogue, and music. Reorders and tweaks content to ensure the logical sequence and smooth running of the final video product. Determines the quality and delivery of the final product. Instructors are engaged in similar processes when planning lectures or writing manuscripts. They often are making decisions about coherent writing, related pace and rhythm, creative approaches to communicating complex ideas, the logic of a narrative, quality of communication, and have developed a careful eye for the effectiveness of the final product. What faculty may not bring to the video editing process is an understanding of the technical nature of video editing or the language of screen-based video communication. Once your guest expert interview video clips are recorded Ecampus videographers coordinate the editing process. An Ecampus video editor compiles the final video sequence, optimizes sound, and perhaps music, graphics, and text elements are added. Decisions about these video elements is a creative and interactive exchange of ideas as editors and faculty collaborate through Frame.io. Frame.io is a post production tool that permits precise editing and video annotation at the frame level of a video. A sample of a Frame.io editing session can be seen in the screenshot below. 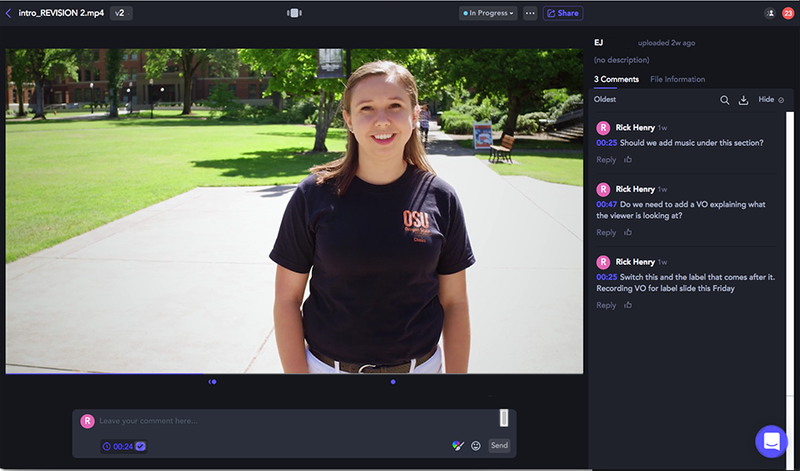 Using the web-based interface of Frame.io an instructor is invited to contribute comments or edits for specific locations in a video timeline. Ecampus editors then incorporate suggested changes and pose other suggestions. The progression of this collaboration is seen by both participants and the process leverages the skills and knowledge of video editors and content experts. In essence the course instructor becomes a co-editor of the video being edited. In Part I of this series a course designed by Dr. Hilary Boudet was involved in planning a guest expert video for her course. Dr. Boudet used Frame.io to help Ecampus editors shape the final video presentation for her course. Watch the PPOL 441/541 guest expert video again. Before you do think about the role a video editor plays in creating the final guest expert video. Also consider what Dr. Boudet might bring to the editing process as a subject matter expert. Can you see evidence of this collaboration in the final video product? In a well planned and edited video production the skill sets of videographer and content expert blend to create a coherent narrative video that presents a focused and quality viewing experience. As course instructors Ecampus faculty are engaged in the planning and staging of a guest expert video. It is in the post production process of video editing that the initial vision of the guest expert video content, as a series of carefully planned video recordings, comes to life and helps fulfill the learning outcomes of a course. Frame.io video review and collaboration software. Posted in Resources, Tools & Trends, Uncategorized, Videos.